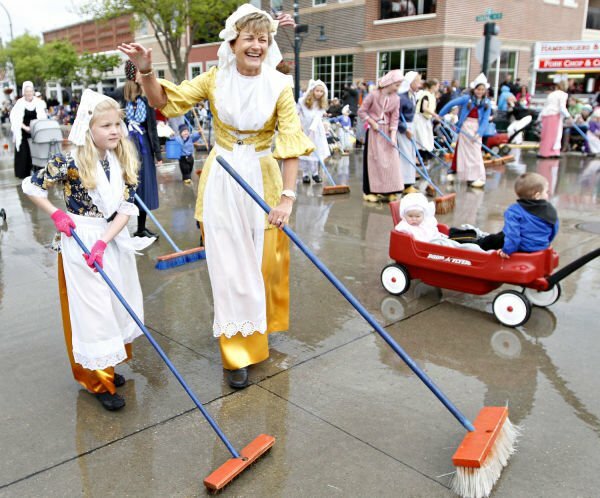 Mackenzie Flikkema, 8, front left, and her grandmother Bonnie Stewart, front right, both of Loveland, Colo., push brooms down Central Avenue during the 74th Annual Tulip Festival Street Scrubbing in Orange City. Luke Elder, left, of Alton, Iowa, and Alyssa Vander Stelt, right, of Orange City, both performers with the Dutch Dozen, walk down Central Avenue during the 74th Annual Tulip Festival in Orange City. Town crier Daron De Jong leads the street-scrubbing activity during the 74th Annual Tulip Festival in Orange City, Iowa. 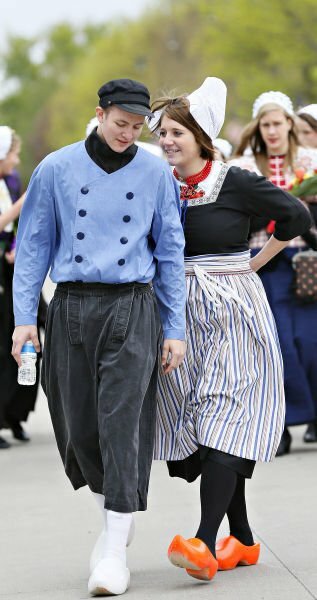 Dressing in traditional Dutch costume is a staple at Orange City's annual Tulip Festival celebration, which celebrates its 75th year in 2015. Bill Kalsbeek, author of “Celebrating Our Dutch Heritage: The Story of the Orange City Tulip Festival," grew up entrenched in the festival. He's shown here, at 7 years old, in a family ​photo from 1954. From left, Bill; ​his ​mother, Florence, holding his sister Mary; his father, Gerard, who was the festival's town crier from 1950 to 1978; and his sister Sharon. ORANGE CITY | Orange City’s annual Tulip Festival celebrates its 75th year May 14-16. Bill Kalsbeek, an Orange City native, was inspired by the festival’s history to research and record stories of festivals past. “When you go back in your hometown, you begin having coffee with your old friends,” said Kalsbeek, emeritus professor at the University of North Carolina and a part-time resident of Orange City. Kalsbeek found himself going through the stacks at Northwestern College, knee-deep in decades-old photos, newspaper clippings and festival mementos. “I just started reading about the Dutch history and the festival, and that led to writing a book,” he said. The book, “Celebrating Our Dutch Heritage: The Story of the Orange City Tulip Festival,” documents the festival’s history and contains hundreds of images that span the decades of the event. To ensure historical accuracy, Kalsbeek conducted focus groups ranging from former festival pageant queens to Dutch dancers who have long retired their wooden shoes. He also interviewed many current and former residents who have participated in the festival for years. “I’m not a historian -- I’m a biostatistician in public health -- but both of these involve collecting information. I organized group interview and broke them down by categories. The whole endeavor took two and a half years,” Kalsbeek said. As he combed through scrapbooks, the amount of community collaboration it takes to make the festival run smoothly stood out. “The community commitment and level of planning is impressive,” Kalsbeek said. Arlyn and Bea Schaap, co-chairpersons of the Tulip Festival Steering Committee, researched the history and foundation of the festival to determine a theme for this year’s festival. The Schaaps settled on “Remembering Our Roots” for this year’s theme. Compiling the history for his book helped Kalsbeek remember his roots, too. Kalsbeek will hold book signings during the Tulip Festival, and attendees will have the opportunity to have their books signed and stamped with the 75th annual Tulip Festival seal. The book signings will take place at Orange City’s new Stadscentrum tourist center from 9-10 a.m. each day of the festival. Kalsbeek, who himself donned Dutch costumes as a child, found himself entrenched in the rich history of the small town’s big celebration as he wrote his book. Piles of photographs and clippings filled his office, and his iPhone almost ran out of space from all the photos he snapped as he documented his research. The festival will include other commemorative features for its 75th year. The community festival, fueled by volunteers, hopes to attract tens of thousands of visitors. And while it’s a celebration of tradition and heritage, it will feature new attractions, too. A craft show will be added to this year’s list of events during the festival. This year will also include Friday night fireworks and a reunion for former Tulip Festival queens and court members -- features that recur every five years. The namesake of Orange City’s Tulip Festival is expected to add a vibrant splash of color to this year’s event.